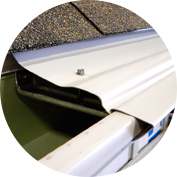 Your Gutter Installation and Gutter Service Contractor in Raleigh, Durham, and Chapel Hill, NC, and beyond. 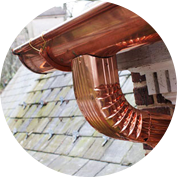 Chimneys Plus is Raleigh, Durham and Chapel Hill’s highest-rated rain gutter installer and we have the perfect rooftop vantage point for observing lots of rain gutters. Across the Triangle, we see a lot of poorly functioning gutters, gutters clogged with leaf debris or improperly hung gutters. The problems caused by non-working gutters are evident and costly for homeowners: Poor drainage, rotting fascia boards, and moldy siding! We can install new gutters or make repairs to solve these problems. 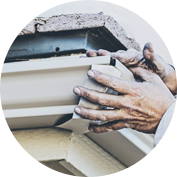 As the Best Rain Gutter and Gutter Guard Installers in the Triangle, Chimneys Plus seeks to combine the best gutter products, solid craftsmanship, quality installation and the unbeatable leaf protection of our Gorilla Guard Gutter Guards. 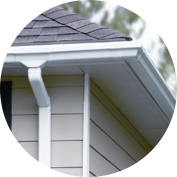 The result is long lasting rain gutter systems that are virtually maintenance free. Chimneys Plus operates on the core values of reliability, value, and life-long customer satisfaction. Contact us for a free estimate! As usual, your company has provided excellent service. We have never had anyone from your company come to our house, speak with us on the phone or any interaction that wasn’t phenomenal. Great service and wonderful customer service. You just do not find that so much anymore and I think that is sad. We always know when we are dealing with your company that we will receive great service and fantastic employees. Hats off to you; you are a great example. A note to thank you and your guys who did my beautiful gutter in record heat. What a wonderful company to work with, your guys came on time, were friendly, good at their jobs and did excellent work. I just wanted to Thank you.